We bought our house in September 2017 from an elderly couple who had been the only owners. It’s our first home as a family of 4 with our two boys aged 2 and 4. The place needed a massive facelift as well as redoing the electrics and wiring so we thought we’d make a project of it. We ended up doing almost a rebuild, including an extension and loft conversion. We wanted a minimalistic but functional home. With two young children it had to be practical but also stylish and minimalistic. We’ve always loved Scandinavian interior style. 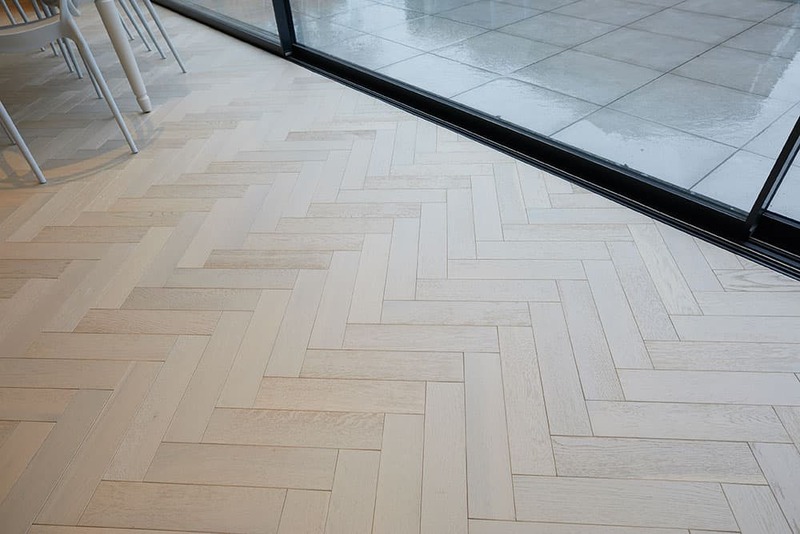 We love look and feel of wood and as we have children, tiles weren’t an option. 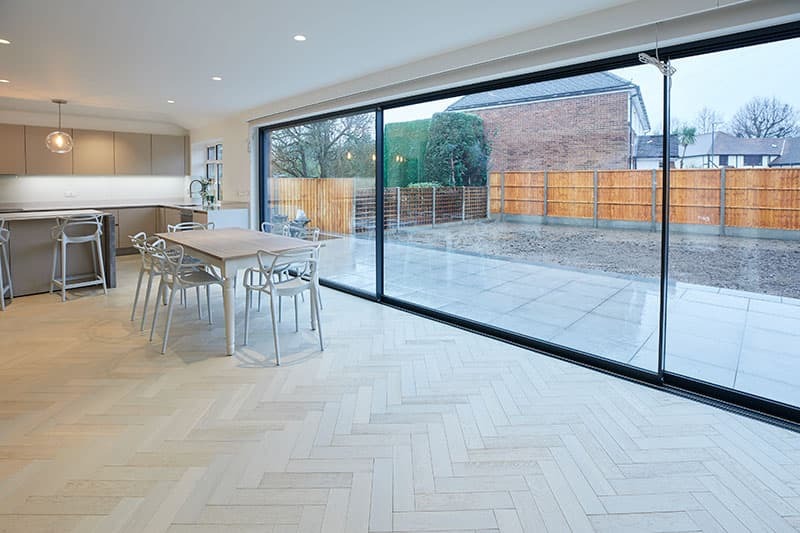 We also decided that we wanted the same flooring throughout the ground floor so the house felt connected. It was while staying in a hotel in Bath that we discovered Woodpecker. 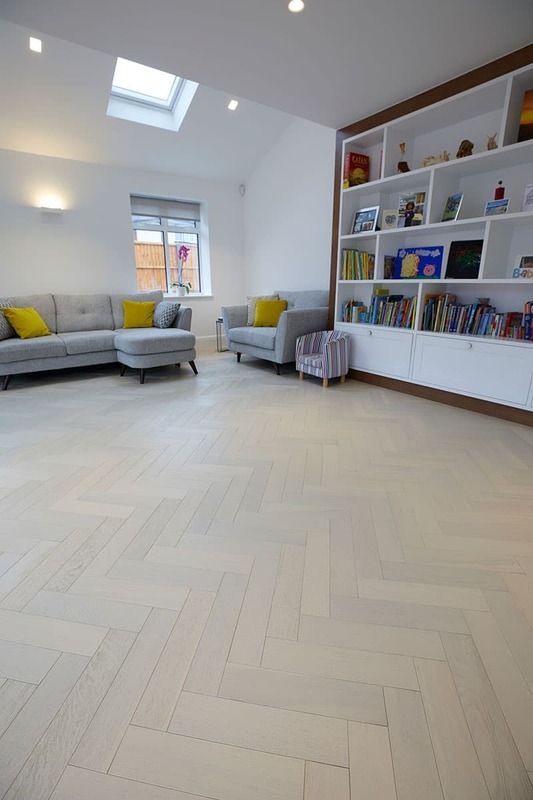 We loved the floor and when we asked, found out it was Woodpecker’s Harlech White Oiled. We ordered samples from the website and started looking into engineered wood as opposed to solid wood, with it being a more practical option. 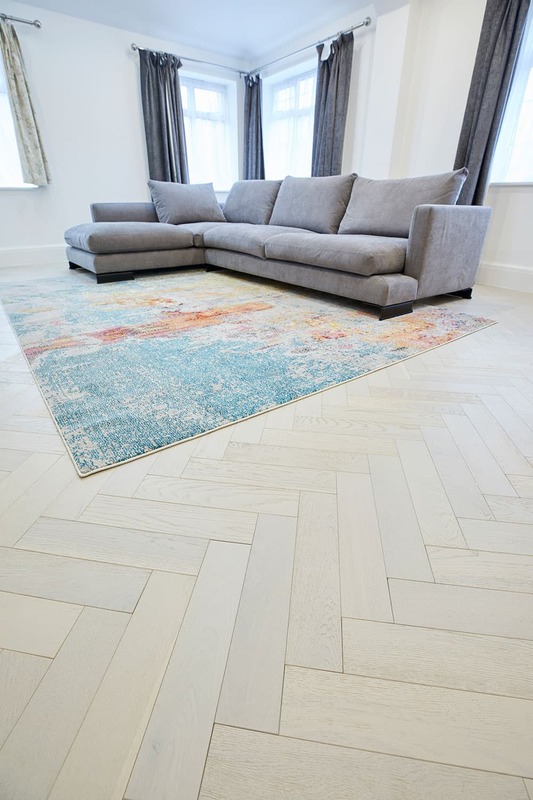 While we loved the colour of the White Oiled Oak, we wanted a parquet so we looked at Cotton Oak, Feather Oak and Whitened Oak from the Goodrich parquet flooring collection, before deciding Whitened was our favourite. 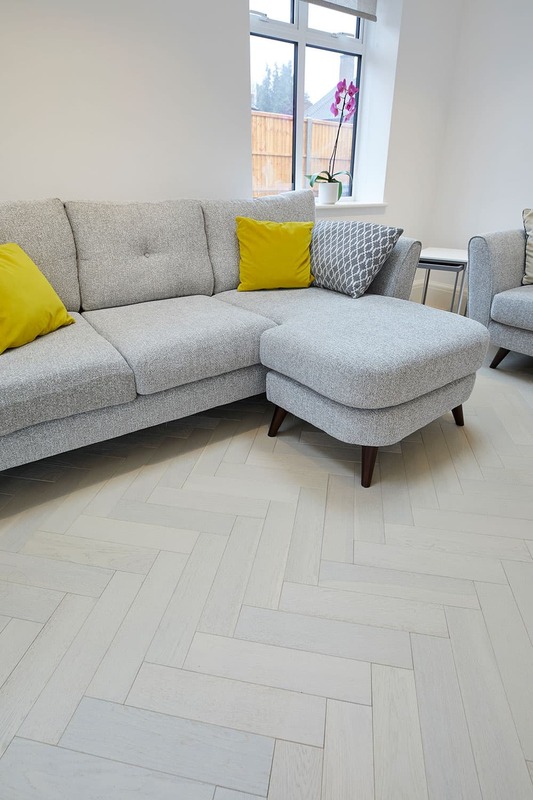 We bought the flooring from our nearby retailer Carpet World in Ruislip and found them very easy to deal with. Our contact Jay was very helpful and gave us great advice about adhesives and timeframes along with a competitive rate! 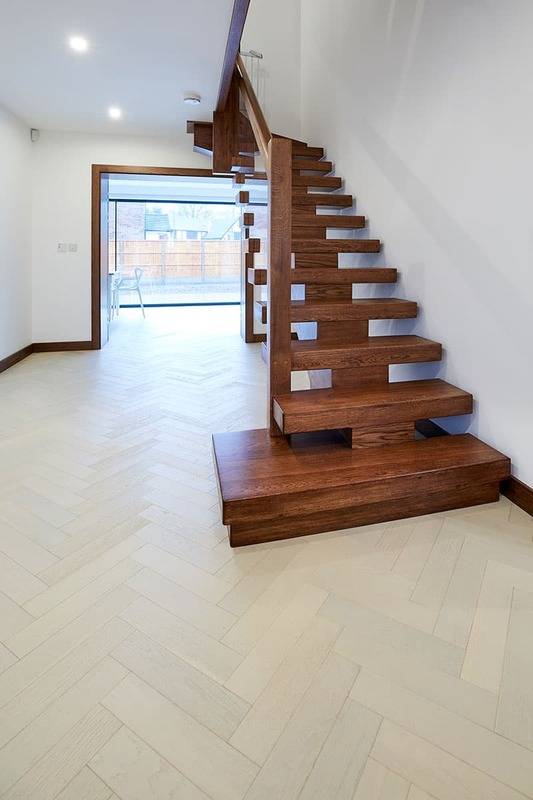 Understanding that wood flooring has natural variations throughout, we chose to review each piece before Whitened was laid. This allowed us to choose what we felt were the most beautiful pieces to be placed in our hallways and open areas. From there on it was a simple process, taking our fitter around 5 days to fit in all the areas – about 100m2. 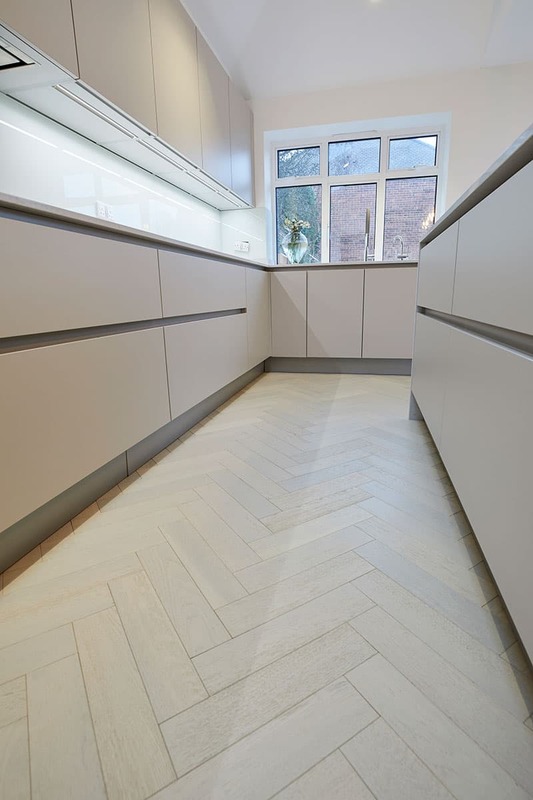 We love the finished parquet floor, with the colours and placement being exactly what we were looking for. And the continuity between the rooms has given us the light and airy feel we wanted. Subscribe for our latest dose of home style inspiration.